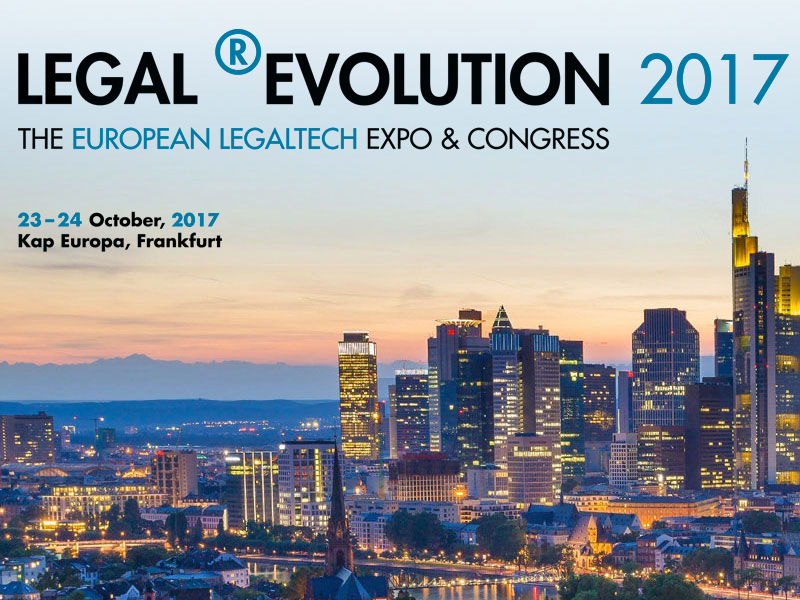 LEGAL ®EVOLUTION – 23 – 24 October 2017, Frankfurt am Main, Germany"
LEGAL ®EVOLUTION – The European LegalTech Expo & Congress offers all members of ELTA preferential terms (15% discount) for your visit to LEGAL ®EVOLUTION 2017. In addition, we are holding a raffle for 3 free event passes for the expo and evening program. Each pass is worth € 469,- plus VAT (after 1 October: € 569). 45 speakers and panelists will prepare lawyers from firms and companies for tomorrow’s legal world. Highlights include the General Counsel Panel featuring Arne Wittig (Group General Counsel, Thyssenkrupp), Steffen Sachse (General Counsel, Aareal Bank), Victoria Núñez Francisco (Head of Legal, Commerz Real) and Florian Schaefer (General Counsel, Leica Camera): “When the Buck Stops: we won’t pay for that!”. Other esteemed speakers include Nicola Beer (Secretary General of the FDP), Dr. Eva Kühne-Hörmann (Hessian Minister of Justice), Prof. Dr. Alexander Lorz (law professor in Düsseldorf and Hessian Minister of Culture), Dr. Thomas Remmers (Vice-President of the German Bar Association), Prof. Dr. Christoph von der Malsburg (Neuroscientist and recipient of the Körber-Prize), Dr. Carsten Linz (Global Head, SAP Center for Digital Leadership and Author of “Radical Business Model Transformation”) and Kalle Palling (Chairman of the EU Affairs Committee of the Parliament of “the digital role model” Estonia). 45 Exhibitors from Germany, the UK, the USA, Belgium, Sweden, the Netherlands, and Russia will demonstrate how legal work can be made easier: efficient contract drafting, document management, automatization, data analysis, knowledge databases, and much more. Visit www.LegalTechExpo.de for detailed information on the speakers and exhibitors. ELTA Members befenit from a special offer: 15% discount on all tickets (incl. group tickets). Registration using the Code (distributed by ELTA via newsletter or please contant julia.bruenjes@lta-online.eu) is simple: Visit www.LegalTechExpo.de and click on the blue banner “GET YOUR TICKET!” Then choose the desired tickets, and click below on “Enter promotion or access code here”. Finally, enter the discount code to secure the reduced price. To take part in the raffle, simply write a short email to julia.bruenjes@lta-online.eu. Deadline for submission is 22 September – thereafter we will perform the drawing and inform the lucky winners. If you have any questions concerning LEGAL ®EVOLUTION 2017, you are welcome to email directly at Info@LegalTechExpo.de.